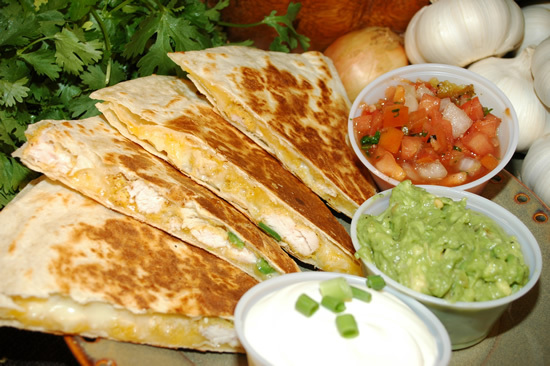 This simple quesadilla recipe is just like what you’ll find in your favorite authentic Mexican restaurant! Serves 2. Heat large skillet and spray with a little oil. Place tortilla (one at a time) on skillet and spread half of the cheese on top of one side of tortilla. Heat one side at a time. Serve with salsa, guac, and sour cream garnish! *Add cooked veggies, chicken or steak with cheese mixture for a heartier quesadilla.